When our stressful modern lifestyle has you climbing up the wall, one way to relax is to climb up the wall. It’s not until you do something energetic that you realize just how unenergetic you usually feel. It’s easy to slip into a routine, to not pay attention to your energy levels and how your body feels. Many of us just try and focus on managing to get through each day. But that’s not good enough. Not when it’s simple to give yourself the energy you need to live life to the fullest. Apart from accident or illness, how well your body performs basically depends on what fuel you feed it. It’s important to eat a variety of foods, lots of fruit and vegetables, and not so much fat. And lots of people try and get around that necessity by supplementing their diet with multi vitamins. Most Multi vitamins are designed to compensate for a dietary deficiency. To make you feel normal. Greenridge Multi Vital is a superior formulation of 15 herbs designed not only to bring you back to normal but to boost you to whole new level of health and energy. Greenridge Multi Vital is a truly naturally derived, whole body tonic for busy vital people. 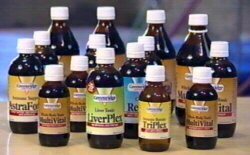 It’s Australia’s number one liquid health tonic and has been developed in Australia by Denis Stewart. Because it’s liquid, your body absorbs it quicker than tablets. So what sot of person would need the sort of lift you could get from Greenridge Multi Vital? Anyone who works long hours, and that’s more and more of us these days. Anyone is a high pressure work environment or who gets stressed over deadlines. Anyone who has to work a lot, has more than one job, or likes to burn the candle at both ends. In fact, anyone who feels fatigued and wants to feel more energetic and get the most out of their life. Greenridge Multi Vital contains superior ingredients from all over the world and is designed to help restore and optimize the delicate balance between mind and body that governs our daily performance and efficiency. Greenridge Multi Vital is designed to invigorate your whole body and gives you a healthy feeling of well being. 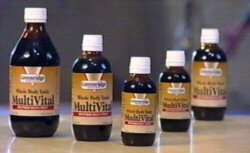 You’ll find Greenridge Multi Vital at all quality health food stores and pharmacies.